When I first started school I wanted to be a teacher. Who wouldn’t want to boss everyone around? By fourth grade, I loved making up stories, so I decided I wanted to be a novelist. Later…solving mysteries seemed exciting, so how about becoming an FBI agent? Like most kids, my thoughts about the future vacillated from one end of the realistic spectrum to the other end of unrealistic. Dreams are grand. Dreams inspire us to reach higher. Dreams are dreams. Expectations are a 1000-pound weight on a tired swimmers back. Throw them into the sea of swarming high school students who think they know everything. Is it any wonder kids drown? I wrote my first “book” when I was nine years old. I filled dozens of spiral notebooks with short stories, longer stories, poetry and general musings from that time until after I graduated from high school. Writing has always helped me express my emotions and sort out my problems. It’s safer to bleed your secrets on a sheet of paper than divulge them to people. A pen ranting on notebook paper gets a person in much less trouble than a verbal confrontation. My yearning has always been to write. I used that yearning to write copy for a non-profit newsletter, lessons for classes I taught at church, and plays and skits for the youth group to perform. I submitted a few stories to contests when I was younger. Tried my hand at writing articles and even wrote a novel. Rejection letters deterred me. My family needed me to be present in the moment rather than rattling around my make-believe worlds. Most people don’t know what they want to do until they’re at least in high school. Some people don’t discover their “calling” until the age of 40, 50 or beyond. 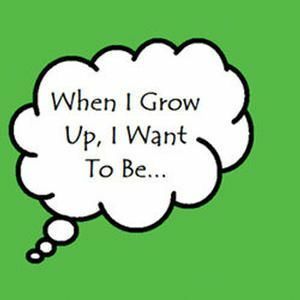 If you’re 18 and don’t know what you want to be when you grow up, big deal. Don’t decide you won’t grow up until you do know. Follow a path. Experiment with different things. Purposelessness has a purpose when you’re using it as a barometer. Some people volunteer at the animal shelter and they know they want to be a veterinarian. Others volunteer at the veterinarian office and decide they love animals, but doctoring the four-legged creatures isn’t how to express it. The only way to find your niche is by doing. Try sports. Try theater. Try writing for the school newspaper (I did). Sing in the choir. Play in the band. Sell lemonade and deliver newspapers. My oldest son found out he didn’t want a manual labor job after he worked at one for the summer. It inspired him to work hard in school so he could go to college. How did he know he wanted to be a computer programmer? You’ll have to ask him. His dad is and he always wanted to follow that path. Go figure. My husband went to college to be an electrician. Yep and he ended up as a computer engineer. Electrical engineer or computer engineer. Slight difference, right? He’s been happy with the choice. Some people like to do many different things. That could mean they would be happy in multiple fields. It might involve tons of experimentation before they find the right fit. Don’t give up. Keep trying. You never know until you try. Words to live by – just saying. Let’s face it, when you’re a teenager, plenty of things stand in the way of finding out your genuine heart’s calling. Money: You either have it or you don’t. Don’t let that limit your vision. Locale: If you live a million miles from nowhere, it’s hard to know if you’d like a career in the city or some other more urbanized setting. What other things have you heard that made it difficult to find your true calling? If you have advice or experience, please share it in the comments.